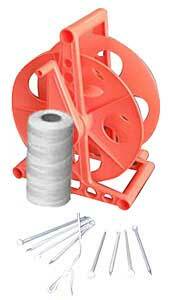 Plastic cord reel, twine & turf spikes; all you need to line up your game day fields. Hand Cord Reel w/Twine & Turf Spikes- 600' spool of twine and 8 aluminum turf spikes. Unbeatable value pack combination of products. Use to line up your game & practice fields. Fiberglass Measuring Tape 330 ft.